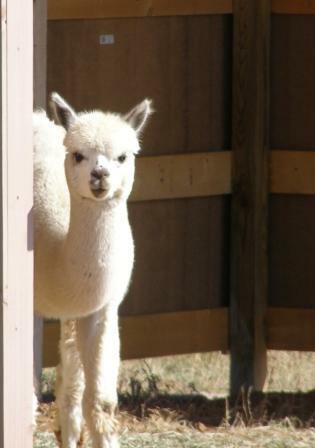 Broonie is everyone's favorite alpaca. 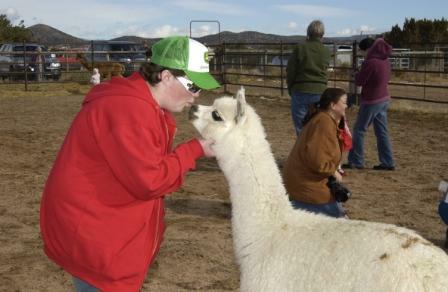 He loves everybody and just cannot understand anyone who would not want an alpaca kiss. It's hard to get a good picture of Broonie 'cause he is much more interested in giving the camera a kiss than having his picture taken. 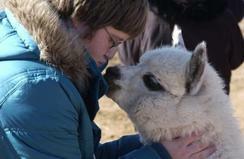 He is not only blessed with a great personality and sweet disposition, he also sports a wonderfully dense fleece with long bundles of bright crimpy fleece. He's a spinners dream, producing butter soft, luminescent skeins of heathery cream colored yarn. If you're looking for a fiber male with great PR qualities, Broonie is your guy!